L’Alezane was a gorgeous chestnut filly with a flaxen mane and tail. 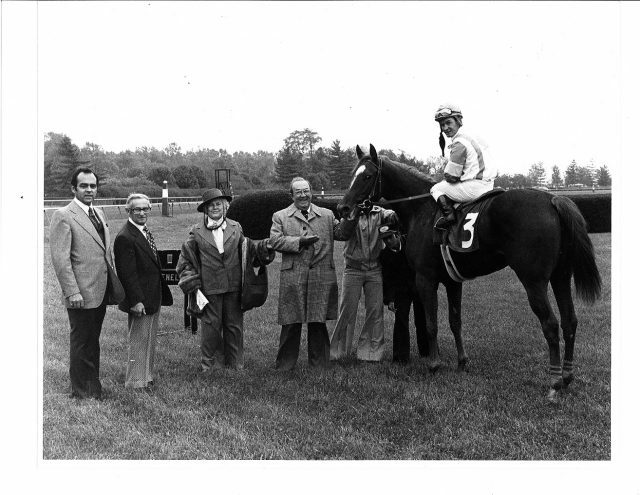 She was purchased as a yearling by Jean-Louis Levesque from E.P Taylor’s consignment at the 1976 Saratoga sales. The price was a very respectable $101,000, and came back to Canada to be trained by John “Yonnie” Starr. Levesque appropriately named her L’Alezane which translates to “The Chestnut” in English. Her breeding was outstanding. Produced by the Northern Dancer mare Northern Willow, L’Alezane came from a very strong family. Her third dam was the great foundation mare Compensate, a daughter of Reaping Reward, E.P. Taylor had purchased for $8,000 back in 1946 as a yearling. Compensate was unraced, but more than justified Taylor’s investment when she went to breeding. She produced multiple stakes winner Censor by Bull Page as well as stakes placed Willow Lake by Windfields. Willow Lake then expanded the family fortunes by producing champion Victorian Prince and a wealth of outstanding daughters as broodmares, including Northern Willow. Among the many stakes winners emanating from this family include Judge Angelucci, War, Teofilo, Victorian Queen, Southern Arrow, Aragen and of course L’Alezane. L’Alezane traces back in tail female to the 1000 Guineas winner of 1897 Chelandry. This great name in racing history founded a very prominent family in the Stud Book. Chelandry had ten daughters in her breeding career which carried on the family in fine form. Her son Neil Gow, by the good sire Marco, became a top class racer when he won the 2000 Guineas, Eclipse Stakes, Craven Stakes and the Champagne Stakes. The family did very well in England. The fourth dam of L’Alezane named Niblick is the link to Chelandry since it is she who was brought to America by Mereworth Farm. Niblick was sired by the great champion racer and sire Fairway. Mereworth bred Niblick to Reaping Reward, a son of Sickle, thus resulting in the birth of Compensate. Compensate was inbred to Phalaris 3×3 as her sire was a grandson and her dam sire was a son of the historically pivotal stallion. A 4×4 inbreed to Chaucer was also created with the birth of Compensate because both Fairway and Sickle are out of Chaucer mares. The sire of L’Alezane was the great race horse Dr. Fager. Dr. Fager had recently passed away at the time his chestnut daughter came to the yearling sales. Considered as one of the all time greats in racing history, Dr. Fager was establishing himself as a superior sire when he tragically died at the age of twelve due to a colon obstruction. Dr. Fager won many championships during his Hall of Fame career. He is still the only horse to win four championship honours within the same racing year. The great champion was posthumously named as the leading sire in North America in 1977, the year his two year old daughter L’Alezane burst onto the racing scene. L’Alezane was not a big filly, but she did have an exquisite look about her. Yonnie Starr was very enthusiastic of her ability and stated that L’Alezane was very easy going and keen to learn her craft. Her two year old season was very close to the outstanding accomplishments of La Prevoyante, a champion filly campaigned by Levesque. L’Alezane became the fifth Canadian Horse of the Year campaigned by the stable in seven years. L’Enjoleur won two, while Fanfreluche, La Prevoyante and L’Alezane won one each. All of these great horses are enshrined in the Canadian Racing Hall of Fame. Yonnie Starr had her ready to impress in her first race, winning the five furlong maiden event in 59 seconds. Four weeks later on Canada Day at Woodbine, L’Alezane won an allowance race by four lengths. This performance set her up nicely for her stakes début eight days later. L’Alezane won the six furlong Shady Well Stakes by an ever increasing five lengths as the 3-5 favourite. Levesque and Starr then decided to take her to Saratoga and challenge the best of her division at the prestigious meet. L’Alezane won the grade three Schuylerville Stakes in her first Saratoga appearance. Exactly two weeks later she made it five for five in her career with a three quarter length win in the grade two Adirondack Stakes. Both of her Saratoga races were six furlong affairs and she was not favoured in either race. Nine days after her Adirondack victory, L’Alezane was made the favourite for the six furlong grade one Spinaway Stakes. She suffered her first loss with a fourth place finish to Sherry Peppers. Starr brought his exciting young filly back to Canada and entered her in the Winnipeg Futurity. L’Alezane captured the six furlongs race over a sloppy track, thus beating males in her first event against mixed company. One week later she was back home at Woodbine and pulverised the field by seven lengths to win the prestigious Princess Elizabeth Stakes, the top race for two year old Canadian fillies. Levesque and Starr wanted to try her on grass for her next race. They entered her in the Natalma Stakes at Woodbine on October 2. Heavy rain created a bog like course on the day, but despite of the conditions L’Alezane ran a gutsy race. She finished second to lightly raced Pottahawk giving her rival an eleven pound weight advantage. For the first three races of her career, L’Alezane was piloted by jockey Paul Souter. Ron Turcotte took over the reins when she went to Saratoga and stayed with her for her Winnipeg and Woodbine races after. He would again be in the irons for her next race, the grade two Alcibiades Stakes at Keeneland in Kentucky. Bet down to 2-5, L’Alezane stamped her authority on the field with an impressive win in the historic race. A showdown was looming for champion two year old filly honours with the emerging Lakeville Miss. The grade one Selima Stakes at Laurel, an eight and one half furlong race would be the site of the showdown. The race came one week after her Keeneland romp. L’Alezane had soundly beaten Lakeville Miss twice before when they encountered each other at Saratoga, but the latter turned the tide and defeated L’Alezane by a length at Laurel. The win gave Lakeville Miss the championship in America. However, L’Alezane captured the Sovereign Award in her native Canada as not only the top two year old filly, but also as Horse of the Year. Mission accomplished. Returning for a campaign as a three year old, L’Alezane did not recapture her consistent form of her previous season. She did win the Selene Stakes at Woodbine, ran second to stable mate La Voyageuse in the Canadian Oaks and third to Regal Embrace and Overskate in the Queen’s Plate. There was also a pair of stakes placed results south of the border. Levesque and Starr thought she may be able to return to her championship self as a four year, so they kept her in training. Unfortunately, the optimism came crashing down on the stable on March 7, 1979. L’Alezane was entered in the tenth race at Hialeah Park on this day, the opening day of the meet. L’Alezane broke the sesamoid bones in her left front ankle. The injury was so severe that there was no way the veterinarians could save her. L’Alezane was humanely euthanized. As with La Prevoyante, the sudden loss of L’Alezane was a devastating blow. No longer would we see the stunningly beautiful golden-red chestnut with the blonde mane and tail. The loss of L’Alezane was another bitter blow to a very enthusiastic patron of the turf. J.L. Levesque was a very prominent Canadian who operated a powerful racing stable and breeding program that won numerous awards and prestige during the sixties, seventies and into the eighties. Levesque was also very instrumental in a brief resurgence of racing in his home province of Québec during his time spent in the sport. Levesque made astute purchases of bloodstock through Windfields Farm consignments early in his racing program. Many of these colts and fillies became stakes winners and, in the case of his fillies, became cornerstone mares to his breeding program. Levesque bought shares in valuable stallions and bred his mares to the likes of Buckpasser, Secretariat, Northern Dancer, Tentam and more. L’Alezane would have become one of these well bred broodmare prospects, had she survived. L’Alezane was very popular with Canadian racing fans. Her tragic demise came only twenty-six months after the equally tragic loss of the great La Prevoyante. The Levesque Stable having suffered two huge losses to their breeding colony. Both L’Alezane and La Prevoyante would have likely made outstanding broodmares, given their respective pedigrees and conformations. Unfortunately, we will never know. So all we can do is savour the memory of L’Alezane. She was one of my personal favourites, having seen her numerous times. Her beauty, speed, class and her warm manner and honesty to people, will never be forgotten by those who had the privilege. Unfortunately, as Billy Joel once sang, “Only The Good Die Young”. L’Alezane was very, very good.